I currently have 2 important projects that need to be finished and released. option menu. There are 4 new difficulties which are elite, master, expert and pro. Normal, hard and arcade are slightly easier. know if you find any. I really need someone to try and beat the hardest level to see if there are any bugs in the gameplay. speed out of the sa-1 chip. I have no clue how long this is going to take but I chose gradius 3 for this because it is a small rom. I hope everyone enjoys the fast rom patch and the extra difficulties. 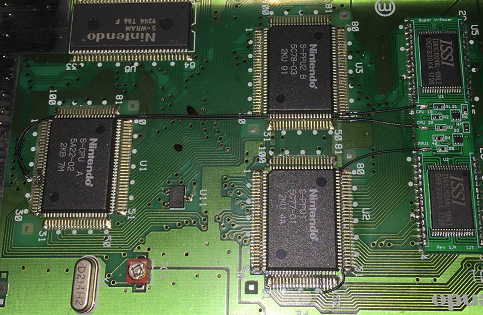 This mod chip is for adding extra vram to the snes. The snes has 64kb of vram but the ppu is capable of using 128kb of vram. didn't have any luck probably because nothing uses the extra vram yet. One day they might add support for it. which is, mega man x with sa-1, 128kb vram and a new engine to have game play like super metroid. rules let me know and it wont happen again and I'll delete the Project #2 post. Wow. I find your mod chip project one of the most interesting things i've seen for a long time on the SNES scene (since the MSU-1, for me). Please, more info! I've read the thread, it does sound really amazing. Interesting. Gradius III is a fun game that I played through a few times back in the day. The game would slow to a crawl every time one of those big serpent creatures was on-screen though. Out of curiosity, have you done any kind of analysis on the code to figure out why it is lagging so badly in the first place? I haven't looked into the game's code myself, though I might take a look now. My guess is that it would be significantly easier to correct some inefficient code rather than try to convert over to SA-1. If it's an issue of graphics decompression, there is also the route of placing decompressed graphics directly in the ROM and bypassing the decompression routine, particularly for commonly used images. I have some more pcb components on the way from China as soon as these come in(about 2 weeks) I’ll be able to see if I’ll be able make the upgrade that I would like to do. I’m going to try to split the pcb into 2 pcb’s. One pcb I’m going to try and put header pins on it to mount it around the cpu and the ppu1 and it will have all of the resistors, transistors, status leds, a couple switches and a connector for a flat ribbon cable on it. The other pcb will only have the two ram chips and a connector for a flat ribbon cable. The second pcb I will also drop the castellated holes for a bga setup. I think this setup will make everything a lot cleaner and professional looking. Now this 2 pcb setup probably won’t work on the 1st released motherboard that has the vertical ram chips because you have to solder directly to the pins on the cpu and ppu but I might be able to figure something out for that one. With my current setup for the pcb using the cpu unused i/o ports I haven’t found any games that don’t work properly. Without using those ports from the cpu there are games that don’t work properly with the major one being super mario world 2. All of the major details are in the link to byuu’s archived forum. I have good pictures for mega man x1 showing what the original 64kb of vram looks like and what the upgraded 128kb of vram looks like and it has the patch for mmx1 and the nSide debugger to create hacks for it. Currently the only games I plan on hacking with the extra vram are mega man x1 and the 7th saga. The only other games I’ll probably add the 128kb of vram to is one that someone has a level editor for that they are willing to add support for the extra vram. Yes I looked into some of it but I still need to do more research on that. From what I was seeing the slowdown is caused by the algorithm for the sprites. Yes removing compression does speed things up but not really during gameplay mostly when levels are loading. I have mmx1 and 7th saga that I have removed all graphics compression and gameplay still slows down but level loading is way faster. I already have 100% of gradius 3 asm disassembled and most of the data mapped out so interesting things are being worked on to improve the game. 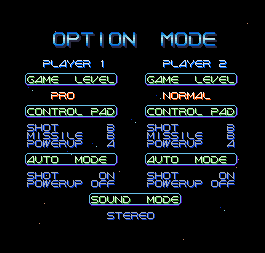 I could release the disassembled asm for gradius 3 but I’m not really sure what the right way is to release it. Can I release a text file with all of the asm on romhacking.net without getting in trouble or do I need to write a program that rips it out of the game? I'm pretty sure you can release it here. There are a few complete disassembly documents on the site already. I don't see any for SNES titles yet though, so that could be a first. I did go ahead and get a trace log on some of the lag, and I can see where it happens, but you're probably miles ahead of me if you already have a full disassembly. Edit: I did a little more research into this. 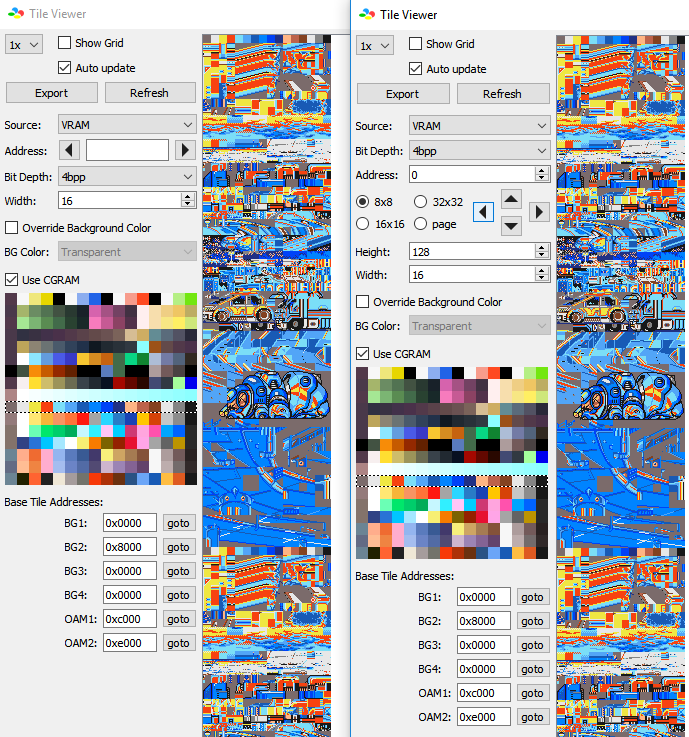 The sprite drawing code does consume a lot of processing time, and I think it is possible to make it run more efficiently. However, that's not the only issue. On the lag trace that I got, the game didn't even reach the sprite drawing routine before it was interrupted by the next NMI. It appears that collision detection is occupying the largest chunk of time, in my test case approximately half of an entire frame. I've done a number of side-by-side tests with the Gradius 3 fastrom hack and the improvement is noticeable, though as slidelljohn stated there is still slowdown. However, when combining the hack with an emulator that allows for overclocking (such as the Snes9X 2010 Libretro core for RetroArch), the game is virtually slowdown-free. It's pretty awesome after all these years to play one of the first 16-bit shmups the way it was meant to be played. Gradius 3 is a personal favorite of mine (I prefer the SNES version--that soundtrack is gold), and seeing it running so smooth (also flicker-free using the above emulator) is a real treat. I'm still not sure about the rules for releasing the full disassembly but Ill probably end up writing a program that can extract it. I do have the main function for gradius 3 that I used to pinpoint the slowdown that I found. without removing that line the game will crash around 2 minutes and 46 seconds. So just that one line of code eats up 15 seconds. Not sure if the collision detection is loaded from that line but I recall 2 or 3 sections of code that shows the slowdown. but improving the code is definitely something that I would like to do. Thanks! I still never tried RetroArch. I guess all the hacking I do eats up all of my free time. I got one of the parts that I was waiting on to see if I can improve the super v-power mod chip and I came up with something even better. I wanted to split the chip into 2 chips so I wouldn't solder wires directly to the board but as I was testing everything I came up with the idea of having one pcb wrapping around the cpu and the ppu so there would be no wires and no ribbon cables. This will only be possible by getting a custom injection molded header pin that connects to the cpu pins, ppu pin, and all of the vram pins. I found a company that can make the custom header pin for me but its going to take some time to get all of the correct measurements for the holes. If I can get this done I can add a bonus to the super v-power mod chip. I can add the super cic chip to the super v-power as well because it also has a hole for every pin for the cic chip. Imagine a all in on 128kb vram and super cic. This is turning out way better than I expected. After I get the pcb shape and the holes correctly mapped out in eagle cad I'll see about getting the custom header pins made. My schematics and custom header pins will all be open source when they are ready. hopefully soon we will all have a really good debugger for future rom hacks that can use this new unused hidden feature for the original snes console. I can take a quick look at optimizing the sprite display code a bit, I have a better understanding of that than the collision code at the moment. of documenting them before I took a break on this project. Thanks ExL! I didn’t know what was going on with that link. The Super V-Power mod chip isn’t actually for helping with lag but a creative programmer could speed up some things with it. I sent the new pcb design for the Super V-Power mod chip to the manufacturer but I’m going to have to do a few test before it’s ready to show off the new version of it. Hopefully within the next 2 months I’ll have something ready to show. The new design is gonna be crazy! Apply this patch on top of your fastROM patch. It reduces the amount of time spent computing individual sprite tiles by about 10% or so. Further optimization is possible, but it would likely be at the expense of rom space and provide benefit mainly for large sprites containing lots of tiles. In other words, creating separate routines for sprites that are vertically flipped, horizontally flipped, both, or neither. This would eliminate the branch checking for these conditions that occurs for individual tiles right now. I don’t have time to look at it today but I’ll definitely look at it tomorrow. I may have to put some of my other projects on hold and work on this one some more. I’ll look more into optimizing the asm code, expanding the rom, and remove all compression this weekend. Im also going to submit the complete disassembled assembly tomorrow. I was able to test your patch right before I left to go to work and it looks like it’s around a .7 second speed up from when the ship first crashes if you let the game play on its own. So yea, definitely around a 10% speed up on top of the fastrom patch. Good work! I am interested in what you did to speed it up but I would probably hold off on the details just in case I can come up with something different to add to it. I just now submitted 2 complete gradius 3 assembly documents and they can be seen in the Submission Queue Status Page. Hopefully within 24-48 hours they are accepted. The 2 gradius 3 assembly documents are for banks $00 and $02. Those 2 banks have the assembly for the whole game. If these get accepted I may start uploading more assembly documents that I have for mega man x v1.1 and the 7th saga. Can I see the before and after of the original sprite ASM code, and the improved sprite ASM code? I'm interested in this project. I checked the "collision code" and it doesn't look like collision code to me. It looks more like a general physics engine. It might have collision somewhere but I didn't find it. Some info on darkmoon's sprite routine hack: It introduces glitchy graphics on the fire stage boss (the two-headed dragon) that isn't in the original fastrom hack. I noticed that this loop happens pretty often, and I wonder if there is any way to remove the loads and stores from $fc and just keep it in the X register. I would optimize this code myself, but I found out that this is in the middle of Darkmoon's code. Only the A register can be used for math instructions (such as adc). I'm talking about the loading and storing. It can just use TXA and TAX and not load and store from $FC until it's out of the loop. probable optimize the code more. I have been gone for a little while but I'm back with some good news on something that I have been working on for the past few weeks. devinacker who has been updating bsnes plus created a branch of the bsnes-plus-v04 that uses the 128kb of vram mod. The branch is called vramexpand https://github.com/devinacker/bsnes-plus/tree/vramexpand. The games appear to be working correctly with the extra vram but some of the debugging features don't work correctly for the extra vram. 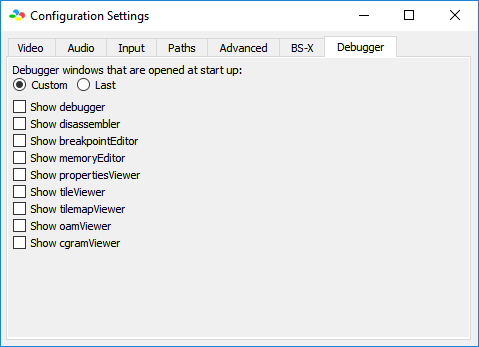 I decided to play around with the source code for the branch to get some of the debugging features working for the extra vram and I'm having good success in modifying the code. Not only do I have some of the extra vram data loading but I'm also adding new features. Here is a image showing the original tile viewer and the one I modified. I added some new buttons and a height scroll box. I also changed how the tile viewer screen gets updated. It now updates almost instantly. Everything still doesn't work %100 in the tile viewer but vram 4bb settings are mostly correct. 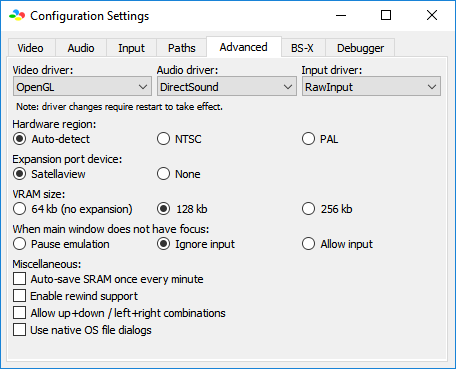 I added a feature that lets you control what debugging windows are opened when you open bsnes plus. You can ether choose what window to have open at start up or you can have it to where the last windows that were opened when you closed bsnes open the next time you open bsnes. I plain on adding more windows to the list and starting options for each window. Now the modification that I made that took the most time is the new cpu tracer. I created a multi threaded, multi buffer near lag free cpu tracer with slightly new text format in trace files. The tracer allows for up to ~2gb trace files and it has a progress bar to see the size of the file being generated. The cpu step and breakpoints are also displayed differently in the console. I also added a clear console button. The new algorithm to generate the trace file still has room for improvement. I should have the new algorithm finished soon. Here is a link to the vramexpand and the modified vramexpand with the changes that I made. This is how you change the vram settings. 64kb is what is in a original snes, 128kb is how much the snes was actually capable of using and 256kb uses a mod that lets you switch between 2 different sets of 128kb of vram. I haven't test the 256kb yet but I will soon. As far as I can tell there are no major bugs or memory leaks from the modifications that I made. Nothing ever crashes. You do need at least 2 gb of ram for the tracer. I hope you all like the modifications that I made. I definitely wouldn't mind helping contribute to the official source that devinacker maintains. $80/914B AND #$EFFF ;clear vflip flag? I simplified this using BIT $06 and either BVC or BPL. There were several other minor modifications as well. As for speeding up the math with $FC by using TAX/TXA, it's doable, but the value in the X register will need to be restored to the address of the object's data as soon as the object's sprites are finished being drawn. In other words, this will only save processing time for the case where there is no active object in a slot. I didn't know this. I'll have to take a look and see if I can find out what's happening. I must have missed something. In other words, extended OAM data needs to be saved prior to checking whether there are too many sprites on-screen. Otherwise the extended OAM data (size toggle, X MSB) might not be saved for the last few sprite tiles in the event that there are too many sprites on-screen at once.